This is my Jam is a cool new music sharing site where you can recommend tracks to your friends and followers. 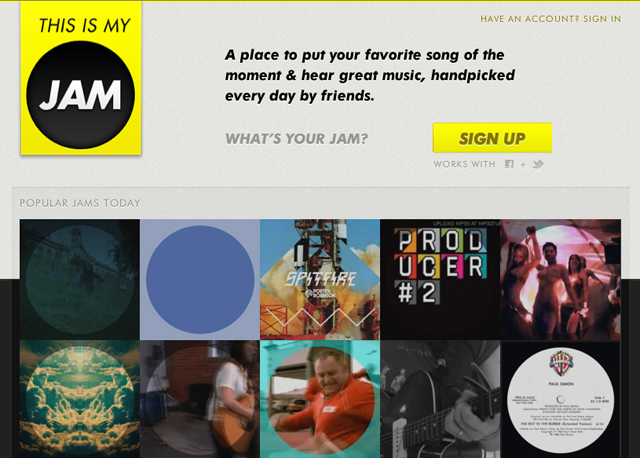 Each week you can pick a new track (your “jam”), which is optionally shared over Twitter and Facebook. Your friends will similarly be recommending tracks and you can listen to them all in one set list – a kind of mix tape for the 21st century. You can also listen to a random jam, drawn from the thousands on the site, or a popular jam, which has had the most listens this week. One downside of the site is that the list of songs is not comprehensive, but this has been nicely sidestepped by allowing subscribers to also select their jam from YouTube music videos, widening the selection considerably. This entry was posted on Wednesday, April 11th, 2012 at 11:32 am	and is filed under Blog. You can follow any responses to this entry through the RSS 2.0 feed. You can skip to the end and leave a response. Pinging is currently not allowed.